Scott Miller tragically died in 2014 in a crash between the tractor he was driving and an auto that rear ended him. This is another sad reminder of the need for everyone to be mindful when driving along our country roads especially during the busy farming season. Scott was one of our earliest and most enthusiastic donors. He would call with an additional 15 to 20 totes of fresh vegetables that he would harvest for us if we could use them. We always could use them. Scott was also one our great OSU Beaver alums. He will be missed greatly. 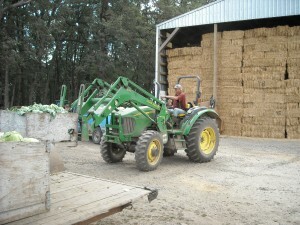 Scott Miller has farming in his blood. 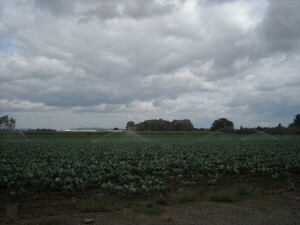 The fourth generation of his family to farm the 400-acre parcel in Woodburn, Scott grows a diverse assortment of crops including beans, grains, grass seed, boysenberries and vegetable seed. 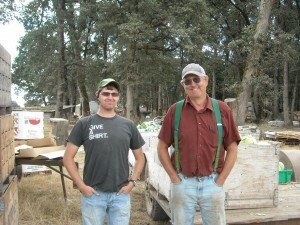 His son Ben is his right hand, performing most of the mechanical work and running the combine in season. Most of the vegetables they grow go to NorPac, but the Millers also supply local businesses and donate to multiple organizations like the Marion-Polk Gleaners. Scott enjoys interacting with the customers for his market vegetables, which serve to keep the patches of land between his larger crops productive. The vegetables he brings to market are planted and harvested throughout the summer, extending the season for products for which there is a demonstrated demand. Consequently, Scott is able to provide consistent work for his employees.